The Repamo mollusc pathology network (REseau de PAthologie des MOllusques), officially created in 1992, is a network that monitors the health status of molluscs along the coasts of metropolitan France, whether these molluscs are cultivated or growing in natural beds. The mission of Repamo is to ensure surveillance according to the current regulations and perform a public service under the Ministry of Agriculture and Fisheries through the Direction Générale de l’Alimentation (DGAL), the competent authority on the subject of marine mollusc health. 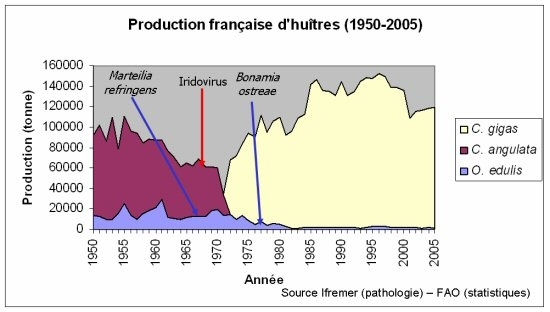 The weakening of the flat oyster: production of the flat oyster Ostrea edulis, already affected by the protozoan parasite Marteilia refringens declined from 20 000 tonnes to 1600 tonnes within a few years after an epizootic caused by another protist, the parasite Bonamia ostreae. The disappearance of the Portuguese oyster: Crassostrea angulata almost disapeared from French coasts within a few years at the start of the 1970s. The epizootics involved viruses, identified as being iridoviruses, which are considered to be the cause. The development of tools to fight mollusc diseases runs into a number of difficulties. Due to mollusc biological characteristics and rearing techniques, few solutions are available to protect them. Prophylactic methods provide a means of sanitary protection, but vaccination is impossible because molluscs have no acquired immunity, and drugs cannot be used under normal rearing conditions because this is often done in the open sea. This approach relies mainly on health monitoring of stocks by the Repamo network. Once a disease has been introduced, the only possible solutions consist of modifying husbandry practices or performing selective breeding using populations that show resistance to the disease in question.